Top brands and organizations trust us with installing and uninstalling their graphics. We work with large retail stores, malls, universities, sign & display makers, graphics producers, marketing professionals, store managers, small businesses and more. 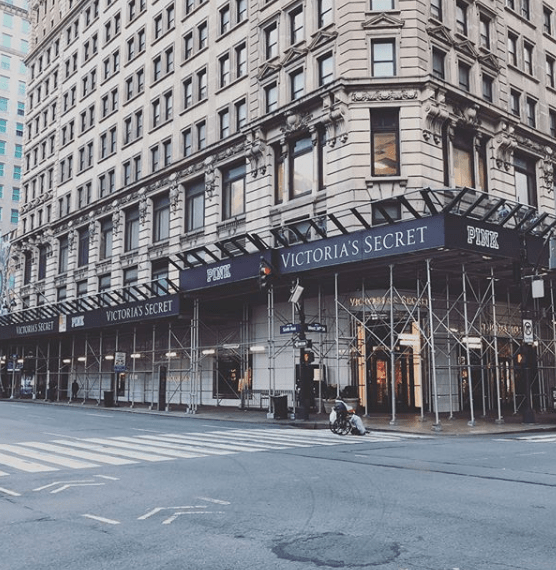 Scaffolding wrap installed in Manhattan for Victoria Secret, 2018. Graphics Installation Company (LLC) specializes in the installation of graphics, 3D window displays, vinyl, barricades, car and truck vehicle wraps, large banners, billboards, posters, signage, flags, and much more. Day or night, we work to accommodate your schedule. Stop wasting time and stop wasting money with inefficient installation jobs. Would you ever hire a chef to do your wedding photography? Would you ever hire the cable guy to do your investment banking? Why are you using your inexperienced employees to attempt installing vinyl or signs? It is NOT saving you money in the long run. Ask any of our amazing clients why they hire graphics installation professionals. We professionally install barricades for malls, stores, and super-centers. Whether you need us to install 1 fixture or 100 signs - no job is too big or too small. Since 1998, we have served the Tri-State area and Northeastern United States. We also have a network of installers dispersed nationwide in order to offer economical and speedy installation. Our indoor and outdoor installations are managed safely & professionally. We have unionized and OSHA compliant installers, $4 Million in liability insurance, and worker’s compensation. Give us a call for more information, estimates, or site surveys. We’ll respond promptly. Headed in New York City, we conduct operations nationwide as well as in Canada.